Who was Max Planck and what did he contribute to our understanding of matter and quantum mechanics? 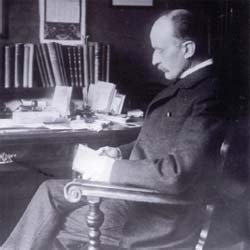 German physicist Max Planck (1858–1947) figured prominently in the development of modern physics, especially in the field of quantum mechanics. As he studied how thermal radiation—electromagnetic waves emitted by hot objects—worked, Planck was the first to derive a mathematically correct way to describe the spectral distribution of energy from a thermally emitting object. To do that, however, Planck used a mathematical method that suggested that light was composed not of continuous waves, but of particles or “pieces” of light called quanta. His theory soon proved to be a fundamental property of light. Today, the main research organization in his native Germany is known as the Max Planck Society, and the national laboratories of natural sciences in Germany are called the Max Planck Institutes, in his honor.